An exclusive and elegant 5 bedroom beach house for up to 12 guests (8 adults and 4 children) with a 14 metre private lap pool and direct access to a beautiful white sand beach, complimentary Wi-Fi Internet and staff in attendance - this must be one of the island's most luxurious spots in which to enjoy a holiday of unrivalled serenity and pampering. This beautiful beach house of Thai-Balinese influence is set in its own private walled garden leading down to the soft sandy Big Buddha beach. Here on the north coast of Koh Samui you are just 10 minutes' drive from the airport, and less than 15 minutes away from Chaweng, the island's main tourist centre with its many restaurants, bars and nightlife. The interesting "Fisherman's Village" of Bophut is also close by, and the Santiburi golf and country club is a short drive away. The villa's decor is one of stylish yet simple design, using light and neutral colours, teak or marble floors and exposed timber ceilings. The grounds of the villa are elevated above the beach and to help ensure guests' privacy, two stairways and gated entrances on either side of the gardens allow access to the powder white sands. Extraordinary views of Koh Phangan, the neighbouring island, as well as the glorious Thai sunsets, can be enjoyed from the villa's rooms and terrace, and at night the illuminated Big Buddha statue is a wonderful sight when viewed from the deck, garden, or beach. The whole villa - which comprises four pavilions - is fully air conditioned and also has ceiling fans to the living room, open air lounge, all bedrooms and the sala. The villa's five bedrooms are situated in two pavilions close to the entrance and furthest from the beach. The large living area and open verandah, with the lap pool before it, are close to beach, surrounded by lawns. 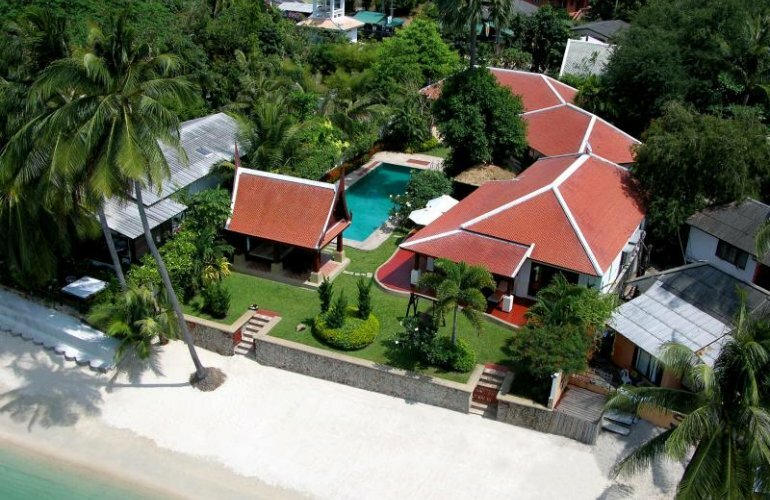 Between the pool and beach, there is a large garden sala for al fresco dining for up to 10 people, where there is also a four poster day bed for relaxing, or enjoying a Thai massage. A garden shower is provided in the grounds, together with an outdoor bathroom. The living room is relaxed and stylish, allowing both casual socialising or elegant dining. The 42" plasma screen home entertainment system has cable/satellite TV and DVD/CD players. There are also board games provided, allowing many evenings of fun and entertainment for a range of ages. There is a fully equipped western style modern kitchen in the living area. The open verandah around the living area has a canopy roof, and a variety of seating and loungers. There is ample room for all guests to relax, sun bathe and enjoy the views from both here and the expansive wooden sun deck in front of the living area. The pool's sun decking has loungers and parasols. The bedrooms offer a choice of bedding configurations: two bedrooms offer double beds, two bedrooms have twin beds; and one bedroom has two sets of bunk beds. In all a total of 12 adults can be accommodated, or 8 adults and 4 children. All the bedrooms have teak floors, walk-in closets, personal safes - and views across the pool to the beach, islands and the ocean. All five en suites have marble floors, marble vanity counter tops and single hand basins, indoor and open air showers and a bath tub. Four of the bedrooms have TV/DVD systems. In addition, the master bedroom suite has an exposed timber ceiling and a writing desk. The second master bedroom suite also has an exposed timber ceiling.